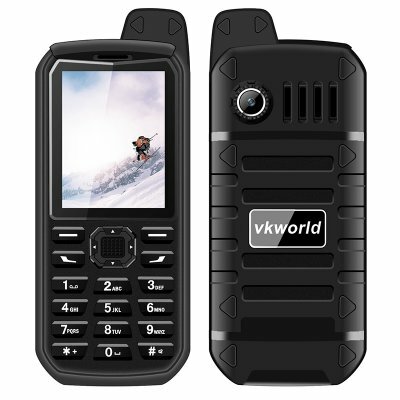 Successfully Added VK World Stone V3 Plus Rugged Elderly Phone - IP54, Bluetooth, 4000mAh, Dual-IMEI, FM Radio (Black) to your Shopping Cart. The VK World Stone V3 Plus is a small and simple elderly phone that offers all that seniors need in one compact and sturdy device. Rated IP54 waterproof, this durable cell phone is protected against splashes and everyday exposure to water. Additionally, this senior phone is fully protected against dust, low temperatures, and drops – making it an extremely durable device that can overcome anything you may have in store for it. Available now and for sale at Chinavasion for a bit over 20 Dollars, the VK World Stone V3 is one of the cheapest phones out there. Packing an epic 4000mAh battery, this elderly phone holds enough power to be used for 72 hours continuously. For the elderly that do not use their phone on regular base, the battery offers a stunning 15 days of standby time – taking away the need of remembering to recharge your battery at the end of each day. By packing so much juice you can be assured that the elderly members of your family will always be within reach and can be contacted at any time. Additionally, this cell phone supports two IMEI numbers, allowing you to be reachable on two different phone numbers simultaneously. With its big box speakers, the VK World Stone V3 Plus supports extra loud audio – making it perfect to be used by hearing impaired elderly. A bright 2.4 Inch display shows characters and letters in extra large size and the large buttons on the phone itself make it easy to operate for young and old. At the rear of this tough little cell phone, you’ll find a sophisticated 0.3mp camera that allows you to snap nice pictures of family gatherings and outdoor activities. By offering up to 8GB of external memory, there will be enough storage for you to save all your files, media, and pictures alike. Besides its camera you will be able to find an extra bright LED light, allowing you to light up your surroundings whenever necessary. Packing all features one expects to find in an elderly phone, the VK World Stone V3 Plus is the perfect affordable cell phone that connects the elderly to the world.